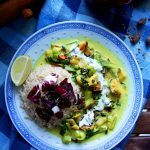 Another good thing about this curry is that it takes less than 30 minutes to make from scratch, making it a perfect healthy weeknight dinner! You just have to grind your spices, chop onion, chili, bok choy and red Chinese cabbage, grate ginger and garlic and you are good to go! Start with making your rice at this point, so that it’s ready by the time you are done with the curry. 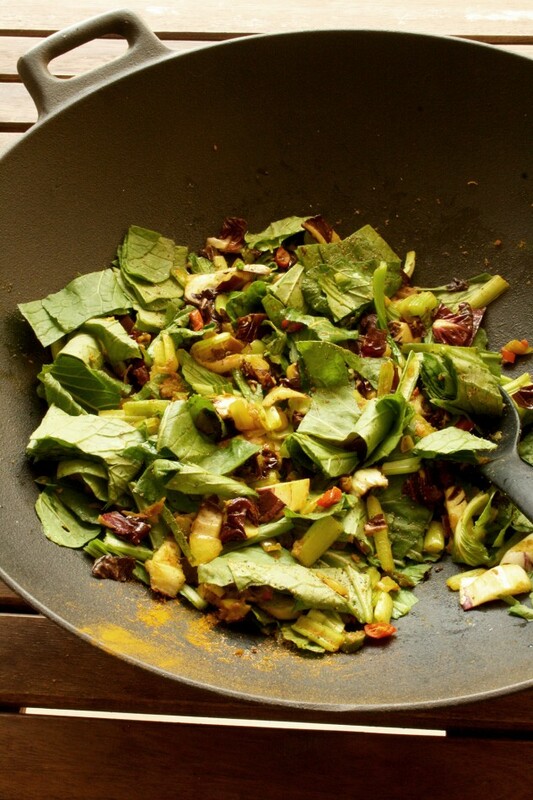 In a wok, heat a lug of vegetable oil and stir-fry onion, garlic, chili and ginger. Add ground spices and enjoy the wonderful aroma. Then add bok choy and red cabbage. Stir-fry for a couple of minutes and add a can of coconut milk, vegetable broth or water and a bit of ground almonds. Then add anchovies and mussels. Simmer for 8-10 minutes. Season with salt to taste. Serve with lime wedges, a spoon of Greek yoghurt and rice or parathas. 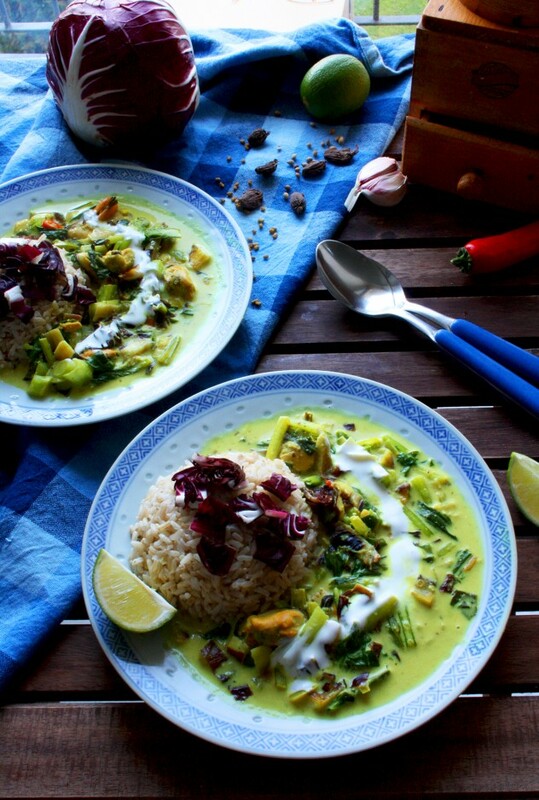 Believe me, it’s so delicious you will make this curry over and over again. In fact, if you practice making it for a couple of times, you are able to make any curry from the ingredients you have on hand. Just learn the main principle: sauté your aromatics in vegetable oil, add spices, add veggies, proteins and coconut milk, a bit of water or broth (and/or diced tomatoes), thicken it with ground nuts and add a splash of acid in the end. With this in mind, you can vary ingredients and make a new curry every time. In fact, I’ve written a FREE e-book for homecooks called “How To Cook Without a Recipe”. My hope is to help you improvise in the kitchen and create mouth-watering dishes on your own without being dependent on recipes. Please tell me what you think about it! 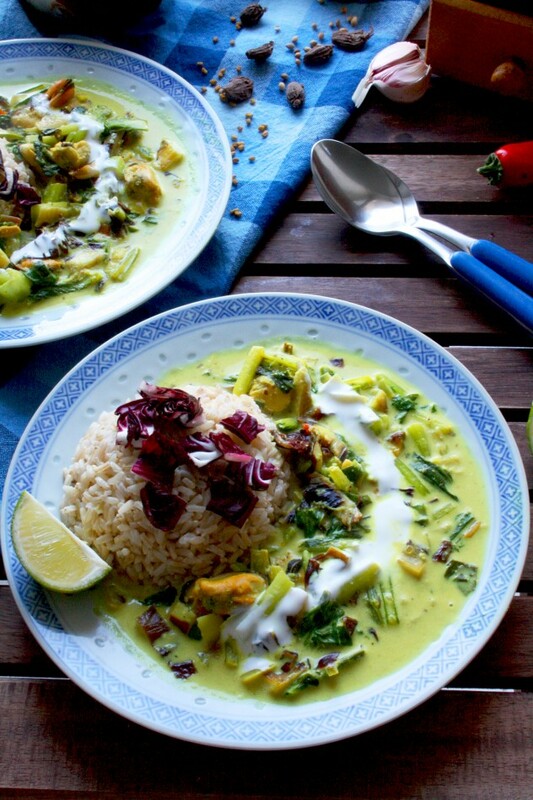 And here is the recipe of my easy green curry with mussels and bok choy. Chop onion, chili, bok choy and red Chinese cabbage. Set a large skillet or a wok with a lug of vegetable oil on medium heat. Start with making your rice (see instructions on the package) at this point, so that it's ready by the time you are done with the curry. Add onion, chili, ginger and garlic to the wok and sauté for 1 minute. Add ground spices and sauté for 1-2 more minutes until aromatic. Then add bok choy and red cabbage. Stir-fry for a couple of minutes and add coconut milk, vegetable broth or water and ground almonds. Then add anchovies and mussels. Simmer for 8-10 minutes. Season with salt to taste. Serve with lime wedges and rice or parathas. Dried anchovies are quite salty, so taste your curry before adding more salt to it. What is your favorite curry? Leave a comment below!